Join the discussion on our forums! Come discuss Wing Blast over in our dedicated Wing Blast discussion topic. Deal $4 damage to a minion. If a minion died this turn, this costs (1). Emeriss uses Wing Blast. It's super effective! Getting hit with this card will cost you ~ 2 arena runs! Solid card for control hunter, but can be also played in any aggro deck. Versatility for hunters is something that class really misses. Love it! Looks very very strong, will be a staple card in constructed for sure. Probably not good enough for constructed, but a great arena card. 4 mana deal 4 is not great, but playable in arena, and meeting the condition isn't that hard to make this card pretty good in arena. It's broken in arena, this will be 4 damage for 1 mana almost always with no drawback. If you're looking for a 1 mana card that will reliably remove a taunt minion but requires a minion to die for it to work, there is Hunter's Mark, which exists right now. The really great part being that if your opponent plays some crazy taunt guy with 8 health, the existing card is much more likely to work. I'm not saying this is a terrible card, but I think better options already exist. And for every scenario where dealing four damage to a minion is better that reducing it to 1 health (like taking out a Mana Wyrm that is protected by two Mirror Image tokens), there are probably just as many scenarios where reducing to one health is better, like bigger taunt guys, killing 8/8 giants, or setting up for an Explosive Trap when you don't have a minion on the board. I love the fact that you could just play this for 4 mana without an activator, but I think there are just better options, like Flanking Strike which gives you a 3/3 for one less damage, or Kill Command which has the option to hit face. My feeling is that this is a good card, but I feel like there are some better options and it won't make most lists, even in control Hunter. A one mana deal four damage is insane no matter what. Sure there are better single removal options but the flexibility of hitting more than one target is more valuable. On top of that you can most likely play minion or spell making it a pretty tempo card as well. While I do agree with your overall analysis, it's still worth mentioning that this can be another decent removal tool for Hunter. Sure, the examples you gave for Hunter's Mark are valid, but why not run both? As I see it, the existence of this card means Hunter has more tools to play a slower styled deck, which they've only recently had a small amount of success with. I agree with what LordBater said. 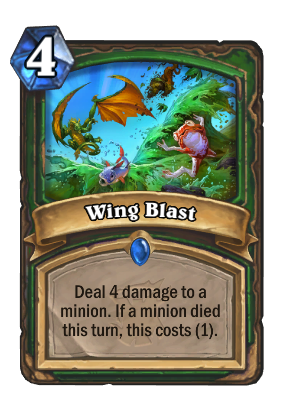 Wing Blast could be the last thing we needed to get a viable control hunter. I doubt it, but it's difficult to judge these things before they're out. The comparison to Hunter's Mark is only valid in the situations when you're using 1 Minion + 1 Spell to kill 1 Enemy Minion. There will be plenty of times when when you use 1 Minion to kill 1 of theirs + this spell to kill a second minion of theirs. Super good art, i want to see the full art of it. Definetly gonna add this to yogg and load hunter, who knows, mayby this, mastiff and other new cards will spawn control hunter deck. Never played, wtf? Hunter's Mark is played even after the nerf in Spell Hunter and it saw a lot of play before as well. Just go to Hunter's Mark page and click on "In Decks" you will see. Hunter's Mark is played a lot. Hunter's Mark doesn't get played much because Hunter doesn't get played much. It's in spell hunter but even that's not exactly competitive right now because it doesn't have any good defensive cards. so that's a common misconception. The "used in X % of decks" isn't actually relevent because that's the % of decks users create in the deckbuilding page on this website. You will almost never see 95% of decks that are on this website.